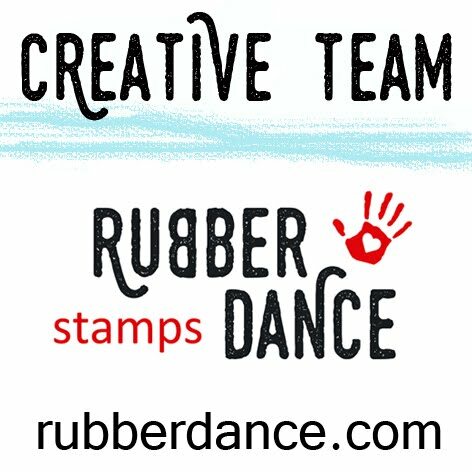 at Fashionable Stamping Challenges this fortnight. and the nights are a little cooler. contrast to the slowing down of the season. to give the contrast and contradiction of the season. and two, because I made a mistake – can you see it? so the left-hand side is backwards, and on the right-hand side it is the right-side up. and I will definitely be making this mistake again. When it is lightly sanded, the two halves blend into each other very subtly I think. and then with heirloom gold. Beautiful vibrant autumnal colours Dot and I hadn't noticed the embossed and debossed sides but since you pointed it out it looks fabulous enhancing the texture further. A fabulous piece of art. How soft and gentle does she look sweetie this card is super gorgeous. Love the mistake Dot and I will definitely be trying it. Totally fabulous piece Dot and so glad you showed us the background, a happy accidents indeed. Love the way you have done the leaves as well, stunning piece all around! The tones are rich but there is also a delicate nature to this stunning creation. So nice. Autumn is also my favorite season -the colors, smells, feel. I think your card captures it beautifully. This card is a delight in every way. I love the rich colours of the background contrasted with the sepia. The vellum is an amazing detail. 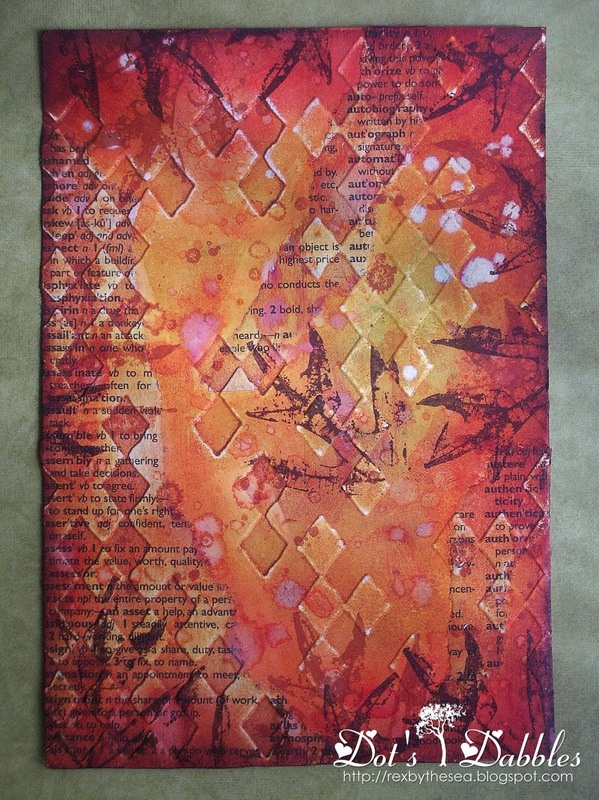 The background is absolutely stunning…fabulous happy accident with the embossing. It created such a cool effect. 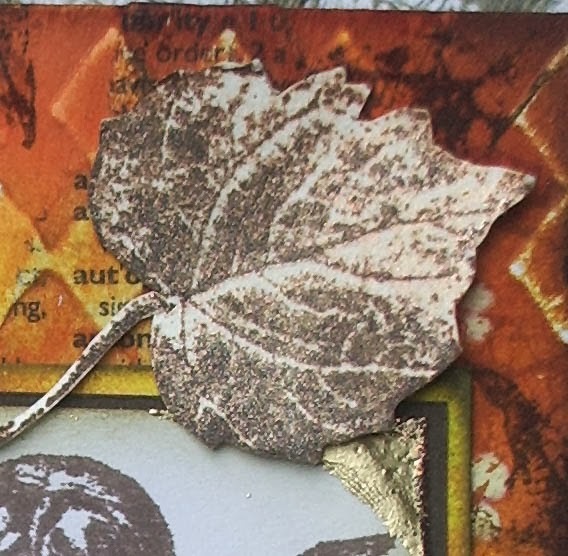 The gold touches on the leaves and the image add lovely richness and glow to the card. 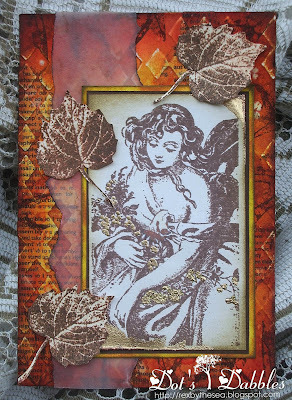 Thanks for joining our Fall/Autumn Colours challenge at Craft Your Passion this week. I hope we see you again soon. Some mistakes are beautifully artful! Love that rich background and those leaves framing that lovely image.! Happy Sunday! So cool, that's a wonderful card. This is beautiful Dot. The colours are stunning and the image is gorgeous. I love it when mistakes turn out to be a good thing. Great background love the textured look of your happy accident, its a beautiful card. Absolutely beautiful…Thanks for joining us at Divas by Design & Fab'n'Funky this week. 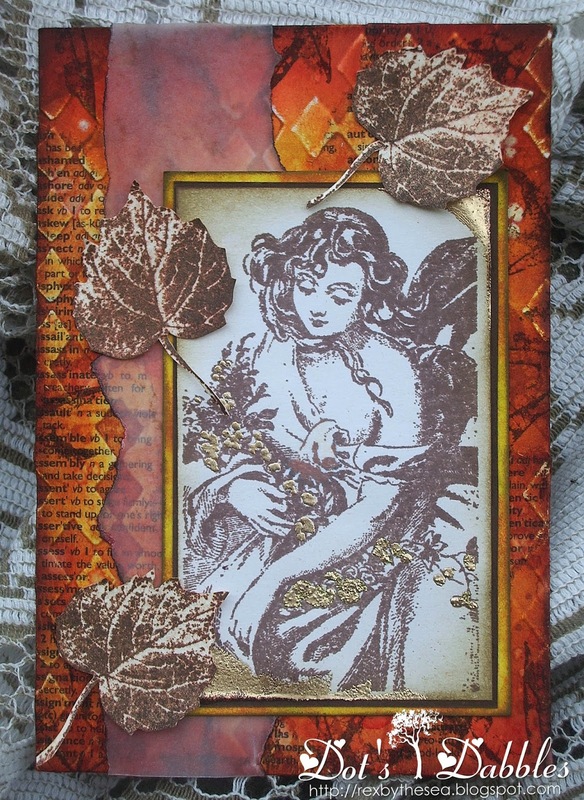 Simply stunning, Dot – and so glad you showed us that glorious background (embracing the imperfection of the "mistake")… you could also pop it in to the Autumn challenge at The Artistic Stamper this month, if you fancy it! Simply fabulous project! Thank you for joining us this week at the Fab'n'Funky Challenge. I hope you play along with us again soon! LOVELY autumnal colors! Such a beautiful card, the background is just to my liking ; in all details: perfect! Gorgeous card, lovely layers and such an elegant image. Your leaves add great texture too. Love the strong background( and great happy accident!) contrasting with the soft tones of the image.